The software proposes a straight number bet after evaluation of the sequence of craps numbers came on table and deciphering of the current algorithm. Following the suggestions of the software everyone can be a winner on craps. 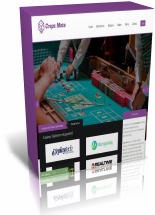 The software offers a user-friendly design and can be used by amateur players since there is no need to know all craps` rules ! You enter -once at a time- every craps number that came on table in the user-friendly interface of CrapsMate software and you press submit button. The software provides you instantly a straight number where you have to place a stake. When you click "Buy" button you will be requested to enter your selected payment method's details. When the payment is completed we will grant you access on our web based craps number prediction software and you'll receive email with your access credentials. We have earned the trust of 1,579 customers. Our software can be used on all major platforms.